Should poems be read from memory? I’ve only really started reading poems from memory this year, but rarely an entire set. I admire those poets who not only memorise long, often VERY long poems, but communicate them with panache and seeming ease. But is reading from memory a requirement of a memorable reading? Does reading from memory always enhance the listener’s experience? Just how much extra work are you setting yourself – and is it worth it? What if the poet’s nervous enough already – isn’t it better for them (and the audience) to stick with reading it off the page? I asked two poet friends (and experienced poem-memorisers) to get their views on it, and also asked myself the same questions. Tony Gill, aka Gilli Bloodaxe, has performed in clubs, a crypt, a barge and at festivals little and big. His first collection Fin was published this year by Matador. 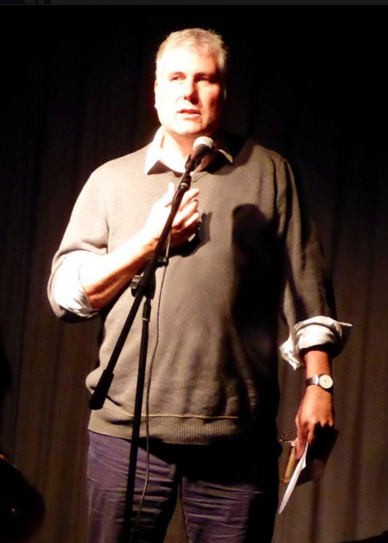 Peter Kenny is a poet, playwright and serial collaborator, having worked with musicians and writers in all kinds of genres. His pamphlet ‘The Nightwork’ was published in 2014 by Telltale Press. What makes you want to memorise poems – particular reasons? 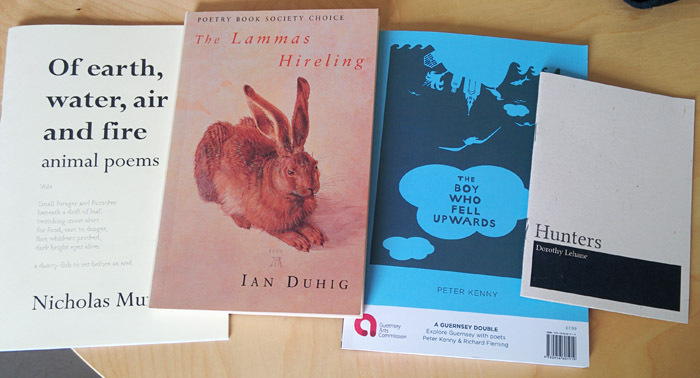 Peter Kenny: I’m starting to memorise my poems and try to perform them from memory when I can. I write to communicate with people, and I think shuffling and hiding behind papers is obviously a barrier. It’s nice to give the audience eye contact and focus on bringing the poems to life rather than simply reading from a page. I don’t like readings where the poet seems to be talking to themselves. Robin Houghton: Reciting from memory really feels like you’re making a connection with the audience, but you do have to make eye contact. That business of ‘focus on a point above people’s heads’ is the worst advice ever given, I think. People have told me they hear more of the poem and take in the words more intensely when they’re being spoken to rather than read to. Do you think it’s something all poets should try to do, or does some poetry not really ‘need’ to be delivered from memory? PK: Interestingly, the reading I found most electrifying was actually not from memory at all: I saw RS Thomas when I was a student and he read from the page without giving the titles of his poems or introductions, but was utterly brilliant. RH: Some poems work much better from memory. But I think a poet can still deliver effectively off the book, as long as s/he adds value somehow to the audience experience. This could be (for example) looking up and making frequent eye contact with listeners, or it could be animating the poem in a way the audience wouldn’t get just from reading it on the page. How do you go about memorising poems – do you have a routine/schedule? How much time do you think it takes to learn a new poem? PK: It takes me several days to learn a poem. I just stand in my kitchen and say the thing over and over for ten minutes for three or four days and I usually have it. Also when you are memorising something, if it is persistently unsayable, then something’s usually wrong with it. TG: Some are easier than others – if there’s a structure, or if they rhyme. Once I’ve learnt it, I see if I can recite it over music, which is quite distracting. The amount of time depends on the length of the poem. But generally not that long. RH: So far I’ve only memorised reasonably short poems. If the poem’s in stanzas then that helps: I do it one stanza at a time. (If it’s not then I might temporarily reorganise it so that it is!) Lots of repetition out loud (it helps if there’s no-one around). Remembering the links between each stanza is important – the last word/phrase of one and the first word/phrase of the next. Because once you start the stanza you’re off and running. I try to ‘see’ the overall shape – the start, the build-up, the aside, the climax etc. It can take me a while, and several actual readings, until I’m secure. Any top tips for a poet who’s never managed to read a poem from memory – how might they go about it? PK: My stepdaughter is an actress and she reminded me to have a few physical movements or body positions for different bits of the poem. Using your body as well as your brain to prompt the next bit seems to work quite well for me. RH: The only other thing I would say is to practise, and in front of an audience. Practise at the low key/low risk readings where you have enough adrenaline to make it real, but no big deal if you stumble because you’re among friends. It will build your confidence for the bigger readings. I always remember the saying “an amateur practises until they get it right, a professional practises until they can’t get it wrong”. I still have a long way to go on that score! Have you ever dried, and what’s your advice if that happens? PK: I have dried completely at least twice but I’m fairly philosophical about it. You’re not in the middle of a play and putting everyone else off. When you make a mistake you feel like there’s a yawning chasm of time when you are giving the reading, but the audience might not even notice as much as you think. RH: I had a near-miss once, but held it together, and quite recently I dried completely and had to reach for the book. I was annoyed at myself but you just have to laugh and not make a thing of it. The audience doesn’t want to see you distressed. TG: Only when I’ve had a drink, which I never ever do before a reading. Excellent suggestions. You’re whetting my curiosity to just try it 🙂 Agree about the importance of eye contact. A great post from Robin about memorising. Interesting how problematic poets find it, while actors memorise other people’s lines as a matter of course. That’s so true isn’t it? Although the idea of acting fills me with fear and horror! The most mesmerising poetry reading I’ve ever been to was Alice Oswald reciting her long poem, Memorial. I had expected her to come out on stage with a book in hand and was amazed that she didn’t have as much as a piece of paper with her. I confess that I like the security of having the printed poem to refer to when I read in public. Hi Caroline – ah yes, someone else told me about Alice Oswald, that does sound awe-inspiring. And not having the printed version even to hand – wow. I confess I take the written poems with me to the front and have them on a table. I still read some poems from the page, I’ve only once done a completely ‘handsfree/copy-free’ reading but that was only three short poems. I don’t ever try to memorise my poems because I’m always making slight adjustments and I’m frightened that my poor memory will get confused and start reading the wrong version. I wants learned the Chinese names for my 66 move taichi but then got told that a scholar had re-translated those names. I tried to unmemorise the first versions and now can’t remember either set of names. So this is just not for me. I admire the rest of you though. Bravo. Hi there – thanks for commenting! I agree it’s not for everyone, although there’s plenty of midway between being totally script-free and never looking up out of the book once, which I’m not accusing anyone of particularly but I have seen it happen! I know what you mean about different versions. I did try reciting a poem that I was still fiddling with and goodness knows how it actually came out. I’ve definitely made mistakes when reading from memory, but the trick I suppose it to keep going. Who’s going to know? Unless you’re reciting ‘Stop All the Clocks’ or something a few people might recognise! What a shame about those Chinese tai chi names – after you went to all that trouble – kudos for that! I am constantly tinkering too cdabell. This has the disadvantage that the poems I feel most confident about reading, tend to be older ones that have at last settled down. This can skew your reading towards being one of ‘golden oldies’ rather than newer perhaps more edgy stuff. I’ve only read a few times and get so nervous that I need my prop! My mind just goes blank. I sing in a choir and there I prefer to learn everything so I don’t need the words (our last MD demanded it, sort of!). It certainly is better for singing because a lot of our choir have their heads in their words and there is no connection between singer and song. Singing, like poetry, is all to do with presentation. it is possible to read/sing with ‘props’ because once you know something well you just need to glance at a word at the beginning of a line to give you that prompt or reassurance. If I read my poetry more often I think I’d have more confidence, but I do try to remember to have eye contact and not stick my head in my sheet of paper! Hope this makes sense! 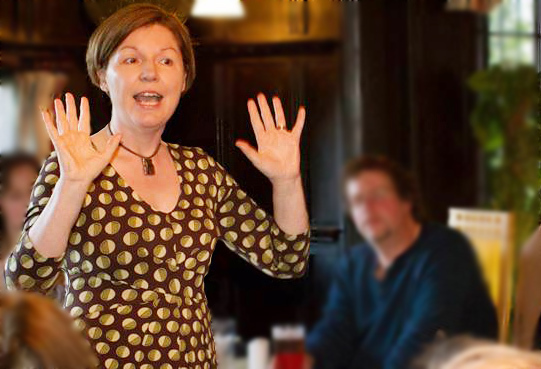 Hi Heather – I understand the choir analogy very well! I’ve never sung in a choir where we’ve not been allowed to have our scores in front of us, but it is liberating when you know the piece well enough that you can look up and enjoy singing out. Even without the communication aspect the voice projects better. I think you’re right about the more often you do it the more confidence you find you have. Thanks for your comment. I recited a poem of mine entirely by heart for the first time at the Mayfield Poetry Festival this summer – fortunately I was only reading the one and it was a sonnet, but it has entirely converted me. I found that the whole question of pace became entirely different from reading off the page, and the experience was somehow tied in with the whole body, so that it was if the body was discovering the poem as a fresh thing. Brilliant. However, when I sat down in the audience afterwards I had a delayed fit of terrible nerves! I found this really interesting. Thanks for it! This has been very interesting. Strangely I have never enjoyed poetry readings from memory, especially not the ones that involve ‘acting’, arm waving, etc. I find it distracts from the words and makes me think that the poet thinks too much of their own work. Also distracting is worrying about whether the poet will remember it all and wondering how and why they have memorised it. .But I do think it is important how the poet reads their own work from the page and that they know their work well enough to be able to lift their eyes quite often. Come to think of it I cant remember seeing a straight forward reading from memory – most that I have seen have been performances of the moving about and arm waving variety and maybe that is why I don’t like them. But perhaps it’s jealousy as I cant do it any more! Hi Meg! Oh dear, and there’s a photo of me apparently waving my arms about! Ha ha! The only thing I can say in my defence is that particular poem is called ‘To turn the perfect cartwheel’ so yes, there are ‘actions’, but it’s quite short! I don’t think the other things I read from memory have any actions. Funnily enough it’s more that ultra-confident ‘portentous poetry tone of voice’ that I sometimes find irritating, rather than the fact that someone has memorised their work. I think if you’re worrying that the person might forget their words then that’s down to the reader, they have to make the audience feel safe. For straightforward reading from memory, Sarah Howe did a fine job at the T S Eliot readings last month, and not an arm wave in sight.. I found it awe-inspiring and thoroughly gripping. But I know not everyone did – horses for courses!! Thanks for your comment, Giles. I think there are techniques you can learn to help with memorisation. They’re based in London, but I hear excellent things about Live Canon and I know people who have benefited hugely from their workshops on the subject.